Freedom and Flourishing: Can New Zealand catch up to Australia? Can New Zealand catch up to Australia? Is New Zealand disadvantaged by economic geography to such an extent that it cannot hope to catch up to Australia’s average income levels, even with further improvements in institutions and policies? That is probably the most important question considered in the second report of the 2025 Taskforce that was released a few days ago. The 2025 Taskforce was set up by the New Zealand government after the 2008 election to recommend how the gap between average incomes in Australia and New Zealand could be closed. Incomes of New Zealanders have generally risen less rapidly than those of Australians over the last 40 years, resulting in a gap between average incomes of around 35 percent in recent years. After the 2008 election, the NZ government committed to closing this income gap by 2025. Since the Taskforce presented its first report last year, Philip McCann - an economist with expertise in economic geography – has advanced the view that New Zealand’s geographical disadvantages prevent it from becoming a high productivity economy. McCann has implied that structural features that are advantageous in the current era of globalization differ so much from those exhibited by New Zealand that this economy could not reasonably be expected to have relatively high productivity. He suggests ‘this is true irrespective of the degree of flexibility in the domestic labour market, the degree of transparency in the local institutional environment, or the levels of cultural aspirations for success’ (‘Economic geography, globalisation, and New Zealand’s productivity paradox’, New Zealand Economic Papers, Dec. 2009: 299). The particular aspect of geography that McCann considers to be most disadvantageous to New Zealand is its relative lack of agglomeration economies associated with large cities. These agglomeration economies arise from knowledge exchanges, better networking and coordination, a nursery role for new enterprises, improved labour market matching processes and greater competition. McCann argues that agglomeration economies can explain the decline in New Zealand’s per capita incomes relative to Australia because of the way the world has changed. One strand of the argument has to do with the increasing importance of knowledge-intensive activities that can often be undertaken at lower cost where face to face contact is possible among the various participants. Another strand is that with closer economic integration between Australia and New Zealand the economy with relatively larger agglomeration economies, i.e. Australia, has become a relatively more attractive location for capital investment and employment of highly skilled workers. McCann sums up: ‘ ... although New Zealand underwent fundamental institutional reforms in the 1980s and 1990s, at exactly the same time as this was taking place the landscape of global economic geography was shifting in favour of other places. It may well be that the deregulatory reforms limited some of the most adverse aspects of these shifts, thereby minimising the productivity gap. Yet the point still remains that the world changed, and the world of the late 20th and early 21st centuries is very different from the world that provided New Zealand with almost a century and a half of productivity advantages’ (p. 300). How does the Taskforce respond? 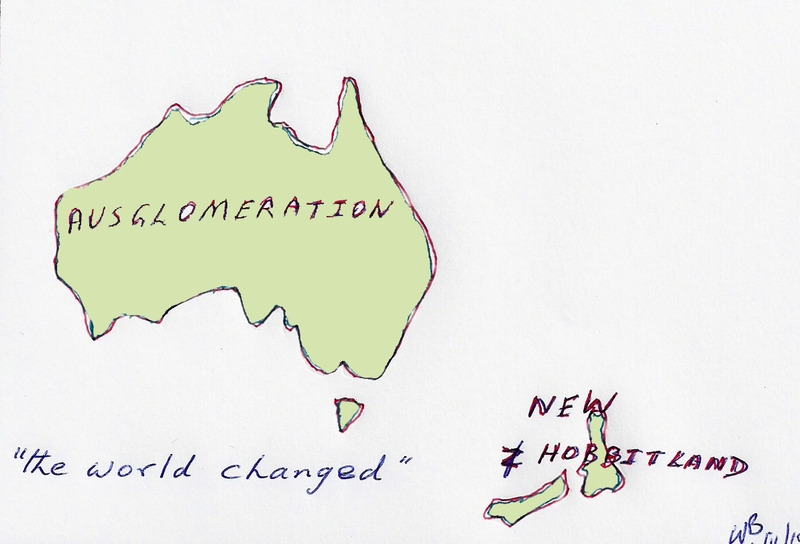 The Taskforce acknowledges that both New Zealand and Australia have been disadvantaged by geography. It notes that according to recent OECD research the impact of greater distance to markets is equal to around 10 percent of GDP per capita for both countries. However, it judges the evidence in support of the view that New Zealand’s small population limits the potential to obtain agglomeration effects to be weak. In particular, Auckland’s position within the regional hierarchy of Australasian cities is not declining – the population of Auckland has been growing faster than the populations of Sydney and Melbourne. The Taskforce also points out that there is no evidence that New Zealand suffered an adverse shock from globalization during the 1980s; that migration from New Zealand to Australia is disproportionately of highly skilled workers as agglomeration theory implies; or that the relative performance of small countries has declined in the past 20 years. The Taskforce concludes: ‘... modern growth theory provides stronger support for the importance of institutions and policy than it does for geography, especially in the deterministic interpretations of economic geography’ (p. 41). 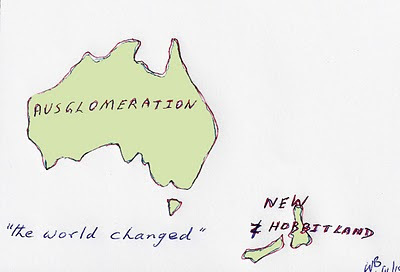 Sitting in Australia, current concerns in public policy discussions about the emergence of a two-speed economy in this country make the agglomeration theory of relative decline in New Zealand’s economic performance seem rather odd. Rather than a concern that agglomerations centred on Sydney and Melbourne are leaving the rest of Australia behind, the main concern is that New South Wales and Victoria (along with other states) are being left behind as economic growth steams ahead in Western Australia and Queensland, as a result of rapid expansion of the minerals sector and related industries. There is also reason for concern that, over an extended period, the particularly poor performance of the New South Wales government has detracted from the substantial location advantages that Sydney should enjoy. If we reject the idea that Australia’s alleged agglomeration advantages make it impossible for New Zealand to close the income gap, where does that leave us in terms of explaining New Zealand’s relatively poor economic performance? The Taskforce pours cold water – correctly in my view - on another geographical explanation, namely Australia’s good luck in having plentiful supplies of mineral resources to export to rapidly growing markets in China and India. It is only in the last few years movements in Australia’s terms of trade have been much more favourable than in New Zealand. Moreover, New Zealand also has substantial mineral and hydrocarbon resources. I think that leaves us with having to explain New Zealand’s relatively poor economic performance in terms of policies that are less favourable to economic growth. That also poses a problem because the impression given by various international comparisons of institutions and policies is that since the mid-1990s there has not been much to choose in overall terms between the economic policy environments in New Zealand and Australia. It seems likely, however, that New Zealand has not performed so well in the areas that have mattered most from a growth perspective. For example, one major problem discussed by the Taskforce is the effect of relatively high levels of government spending in discouraging investment in export industries - via impacts on the real exchange rate as well as tax rates. The Taskforce has expressed the view that closing the gap in average income levels by 2025 will require policies that are superior to those in Australia in their focus on growth. It seems to me that those who believe that New Zealand has geographical disadvantages should logically be strong supporters of that view (unless they reject the objective of closing the income gap). The greater the geographical disadvantage, the greater the policy superiority New Zealand will need in order to meet the objective of closing the income gap by 2025. I really don't see a lot of sense in this study. I personally feel Governments shapes the Country good or bad, as of late mostly bad I feel. New Zealand not long started their cap and trade, this would of had a big effect on everything in the Country again. The last I heard, it was affecting farmers the most, and some were dividing and selling off the land. This in turn will have another affect on their economy. Australia's position will also change if our Government manages to introduce a carbon tax. However I do agree that because of the positioning of both Countries we are at a disadvantage, compared to most of the other Countries, "The Land Down Under" is really spot on, and the same could be said for NZ. We both are so far away from everything, and this in turn is a disadvantage in a way. I get the impression that some New Zealanders are now wondering whether it was a good idea to put a price on carbon before major trading partners. The only way NZ could hope to have a significant effect on global emissions is if others follow their lead. It doesn't look as though that will happen over the next couple of years. The same reasoning applies to introduction of a carbon tax in Australia, but (as I have argued previously) we do have potential to introduce a carbon tax without economic harm if we are clever enough to use the revenue to get rid of taxes that have a more damaging effect on economic growth. As you know I'm not a believer in "Global Warming" or man made "Climate Change" so I believe it's more to do with money. I see your point about dropping other taxes, this will never happen. If you remember just before Australia began it's GST, it was introduced by the Liberals, with the conditions, that within a certain time period, the states would drop stamp duties, and other state taxes, all states agreed with this. Of course this never happened, the states which Labor was in control, never intended for one minute to drop any of the taxes and now of course we pay "double taxes" on everything. So even if they said they would drop other taxes surely people would not be silly enough to fall for this a second time, especially with Labor. Better, perhaps, to allow the drivers of investment appropriate to individual cities to play out, and work on developing and supporting our own strengths. Whether or not NZ can close the gap with Australia is not especially relevant, though. Maintaining economic growth at least keeps the options for individuals open. Again, let’s work on what makes New Zealand and all its cities distinctive and attractive places to live and invest. Me-too angst and policies derived from abstract academic constructions around agglomeration and global cities are not what we need. It seems to me to make a lot of sense to allow the drivers of investment appropriate to individual cities to play out. Regarding me-too angst, if I understand the point correctly, it seems to me that in the best of possible worlds governments wouldn't have objectives like getting per capita incomes into the top half of the OECD or catching up to Australia's average income levels. They would just get rid of the economic distortions resulting from their policies and allow the preferences of consumers, investors, workers etc to be fully reflected in economic outcomes. However, I think it is highly unlikely that catching up to Australia would involve pushing per capita GDP in NZ higher than would emerge in a free market. Perhaps I should add that I can understand why NZ politicians benchmark against Australian income levels. A lot of the people they represent are making comparisons with Australia when they decide where to live and work, and where to go on holidays etc. This was an interesting post, Winton, one that I made reference to this morning. Back in the 1990s, what was called the Porter Project made a remarkably good analysis of the causes of NZ's then economic woes. However, it was very weak on possible answers because the very assumptions built into it actually denied that Governments could affect the competitive positions of nations. At the same time, we had the emergence of what I call the NZ model. Rogernomics was one aspect, although it was the NZ Treasury that articulated the theoretical structures. I had and have a lot of time for the model. However, in both NZ and Australia, the model was combined with a totally different set of views about the role of Government that were in fact independent of the model. I agree that the comparison between NZ and Oz averages is misleading. If you disaggregate the Oz averages, you will find that the regional gaps in key variables such as average incomes within Australia are at least as great as the gap between the two countries. Before you take measures to do something like bridge average gaps (indigenous disadvantage is an Australian example) you actually have to work out what the gaps mean. This includes examining the statistical sources of the gap. In this context, and as an example, it is far from clear to me that the majority of the NZ population is worse off in real terms than their Australian equivalent. I will try to tease all this out in a companion post once I have finished the current Greek series. Thanks for your comment here and on your blog. I can more or less remember the Porter report. A lot of his reasoning made sense but Porter used to annoy me a little - probably because he seemed to be making a lot of money by just inventing a new language to describe pecuniary external economies. I will be very interested to see what you come up with in comparing incomes of people in similar situations in Australia and New Zealand.